Kumarakom is a collection of small and scenic islands and is one of the most sought-after travel destinations in Kerala. Nestled on the Vembanad Lake which is regarded as the biggest freshwater lake in Kerala, it attracts travelers from all over the world with its pristine and crystal beauty. Located at a distance of about 12 km from the district of Kottayam, this place gained worldwide recognition on account of its backwater tourism. Surrounded by many streams and dotted with emerald stretches of greenery, the green peninsula of Kumarakom invites travelers to unwind and revamp. Kumarakom Beach is one of the most enchanting beaches in Kerala and is a perfect location to unwind and relax. The long stretches of sandy shores make it a favorite spot to engage in leisurely activities. The various activities that you can indulge in here includes swimming, volleyball, water skiing, parasailing, wind surfing and water aerobics. Those who want a day or two away from the madness of cities can come here to enjoy the tranquility. This is a perfect spot where travelers can find harmony with themselves by engaging in leisurely activities, reading books, watching the sunset and sunbathing. There are plenty of resorts and homestays located close to the beach. Travelers who come to this sandy paradise are sure to feel rejuvenated before they get back to their hectic routines. The Kumarakom Bird Sanctuary or the Vembanad Bird Sanctuary as it is called is located on the eastern shore of Vembanad Lake. The sanctuary is set in the backdrop of the backwaters and is a truly mesmerizing locality. It is a seasonal home to hundreds of migratory birds and serves as an absolute treat to birdwatchers and ornithologists. The major bird species of the sanctuary include cuckoo, waterfowl, heron, cormorant, owl, teal, lark, egret, moorhen, Siberian crane, darter, Brahminy kite, parrot and flycatcher. A trek during the sunrise or sunset will delight birdwatchers for they get to watch flocks of birds flying across the scenic setting of the tranquil skies. The timing of this sanctuary is from 10 AM to 6 PM and is open all throughout the week except on Sundays. The Kumarakom Backwaters is a major tourist spot and attracts millions of travelers from across the globe. The tranquility of the lagoons and the emerald stretches of vegetation contribute to the beauty of the backwaters, making it a much sought after destination. The ideal way to enjoy the splendor ofthis place is by hiring a houseboat. Travelers can canoe through the intricate networks of canals, lake and lagoons and enjoy the manifestations of nature's myriad wonders. These houseboats are fully furnished luxury vessels and are available at different rates for picnicking families, honeymooning couples, adventurous youths and corporate meetings. 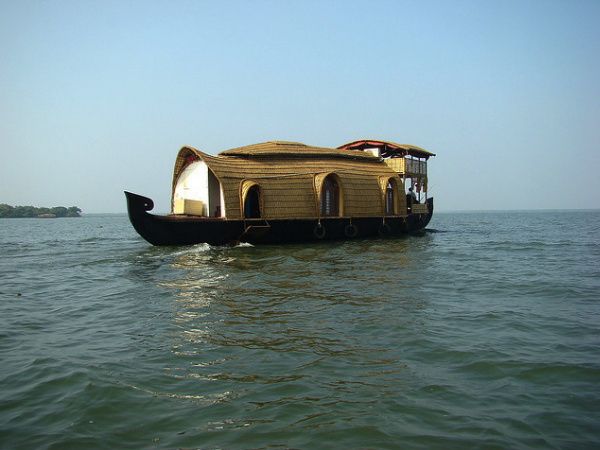 There are a number of private agencies that arrange for houseboat packages that include full-day, over night and hourly tours on the backwaters. Travelers get to enjoy all the amenities and the houseboats have a living room, bed rooms, kitchen, balcony, entertainment options and food. Trained staff will be available on the boat to help and guide the travelers. Vembanad Lake upon which the cluster of islands that form Kumarakom is situated, attracts traveler with its picturesque beauty and pristine water body. It holds the record of being the biggest lake in the state of Kerala and the longest lake in the country. The lake spans across several districts and is also known as Punnamada Kayal andKochiLake. The lake is globally famed for the annual boat race, Nehru Trophy Boat Race, which is conducted here during the Onam festival. The eastern portions of the lake is home to a wide variety of migratory birds and housesKumarakomBird Sanctuary, a prime tourist attraction. The Ettumanoor Mahadeva Temple is a popular religious spot aroundKumarakom and is located at a distance of about 10 km fromKottayamtown. This is one of the oldest temples of Kerala which is dedicated to Lord Shiva. The temple has a history that goes back to many centuries, and it attracts millions of devotees every year. The present structure of the temple is believed to have been renovated in 1542. The temple is best known for its mural paintings of which the most renowned one is a fresco named Pradosha Nritham also known as Dance of Shiva. It is considered as one of the most outstanding wall paintings of the entire country. The temple complex comprises of the sanctum sanctorum, the main idol, shrines dedicated to Lord Ganapathi and Lord Shasta, a golden flag staff and roofs covered with copper plates. Vaikom Mahadeva Temple gathers attention from all over the country for it is one of the oldest and most historic temples of Kerala. The temple is situated in the town of Vaikom which lies on the sides of Vembanad Lake. The temple is unique for it is one of the few Shiva shrines which are worshipped by the Shaivaites and the Vaishnavaites alike. The presiding deity of the temple is Lord Shiva. A stone carved statue of Lord Ganesha and a sculpture of Nandi can be found in the temple complex. By Train: Those who travel by train can get down at Kottayam railway station which is at a distance of about 15 km from Kumarakom. Kottayam railway station is well connected to other Indian cities such as, Chennai, Bangalore, Hyderabad, Delhi and Mumbai, and. By Road: Kerala State Transport buses (KSRTC) as well as private buses are available to Kumarakom from Kottayam. Luxury buses run regular services to major south Indian cities like Bangalore, Coimbatore, Kochi, Thiruvananthapuram and Chennai. Travelers who want to explore Kumarakom can opt for tourist packages organized by private bus agencies.